We're reviewing The Ring Cycle! 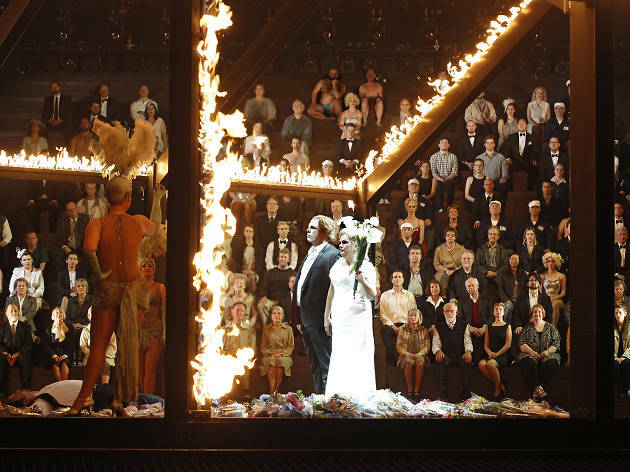 Read our reviews of Das Rheingold and Die Walküre and Siegfried. Tolkien was right when he said there was one ring to rule them all, he just had the wrong ring. The true ring of power that has dominated western culture for over a century is Wagner’s Ring, otherwise known as Der Ring des Nibelungen. A cycle consisting of four operas, it has thrilled and exhausted opera lovers since its debut at the first Bayreuth Festival in 1876. OK. Here we go. Just as in Tolkien, there is a magic ring that gives the bearer the power to rule the world, but this one is forged by the Nibelung dwarf Alberich. Wotan, chief of the gods, steals it but is forced to hand it to the giants Fafner and Fasolt, in payment for building Valhalla. 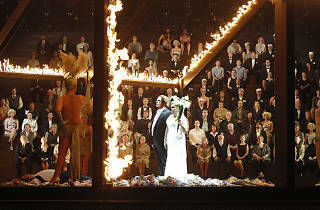 Wotan’s scheme to regain the ring drives the plot, ensnaring his daughter Brünnhilde and her lover Siegfried. Still with us? Siegfried manages to slay Fafnir – who has slain Fasolt – and seizes the ring, but is betrayed and killed by Alberich’s son Hagen. Brünnhilde throws herself onto her lover’s funeral pyre, Hagen drowns trying to recover the ring, and Valhalla and the gods are all destroyed. Simple. Armfield’s production came to Melbourne in 2013 and was lavished with praise by critics and audiences alike. The 16-hour running time and proliferation of dragons, gods and cursed jewellery certainly tips the cycle into the epic, but Armfield always approaches his operas from the inside out, ensuring those moments of great spectacle are underwritten by the emotional and psychological truth of the characters. In aid of this, OA has gathered an incredible cast, including Lise Lindstrom and Stefan Vinke as the lovers Brünnhilde and Siegfried, and perennial favourites Jacqueline Dark, Warwick Fyfe and Jud Arthur. The phenomenal score will be played by a souped up mega-orchestra of 135 musicians, and conducted by Pietari Inkinen. Securing tickets to this event will give you boasting rights for years to come, which is just as well because they’ll set you back a pretty penny. Tickets start around $120, but really good ones will set you back $530. And that’s for a single opera! So maybe pawn your diamond rings and get yourself to the only Ring that matters. The destiny of the world is at stake.